I made collard chips yesterday, but it was because of the French fries. I seriously love French fries. 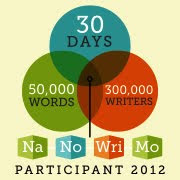 I go into withdrawal if I don’t have them once every two to three weeks or so. Captain Caffeine will actually go out and buy them for me when I start climbing up the walls. We’ve gotten a lot of potatoes lately in our organic co-op, so I decided to make French fries. 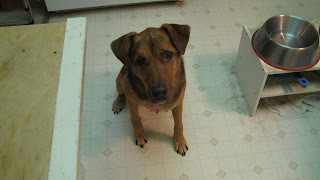 I got out my Fry Daddy and whipped up several batches a few times this past week. I got so fry happy that I decided to try deep fried kale chips, which turned out absolutely completely AWESOME!!! Unfortunately I didn’t take pictures. So then I thought I’d try collard greens and see how that tasted, and they turned out great too! They’re a bit more “green” tasting than the kale--the kale chips actually tasted a little sweet, maybe from caramelization. 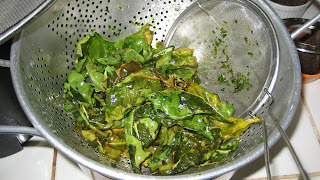 But the collard chips were just as crispy and tasty as the kale chips. 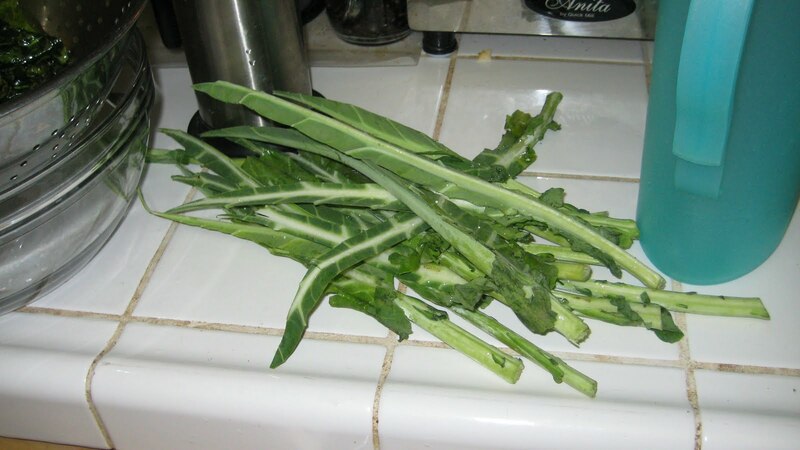 Plus I had two huge bunches of collards and was thrilled to find a new way of eating them. Pour oil into the Fry Daddy up to the fill line on the inside and plug it in. Wait 15 minutes for it to heat up. Wash collards and remove ribs. Pat dry as well as you can. Cut into about 2-inch squares. Once those collards hit the hot oil, the water is going to make the oil boil and make a lot of noise and mess, so I put a metal splatter screen over my Fry Daddy. 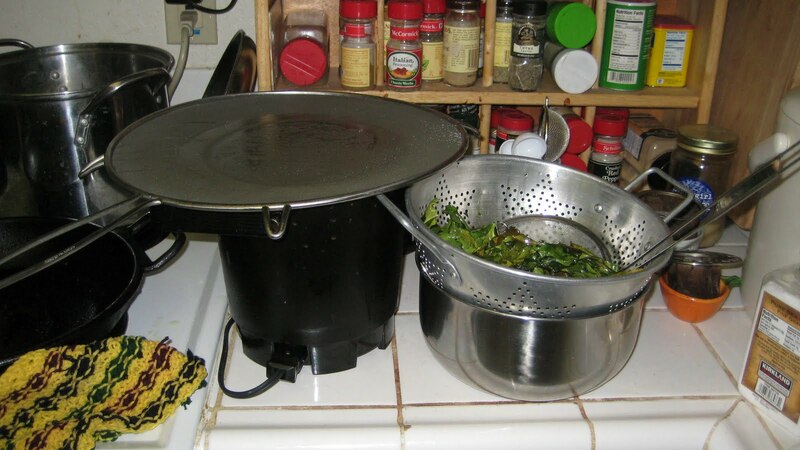 I load a metal deep frying strainer with chopped collards, then quickly lift up the splatter screen, dump the collards in the Fry Daddy and replace the splatter screen as fast as possible. The first time it happens, the boiling oil sounds massively scary, but you’re okay as long as you have the splatter screen on top. Let it fry for about 1 minute. 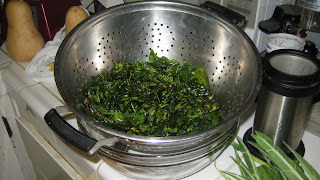 Remove the collards into a metal colander set into a metal bowl to catch the dripping oil. Wait a little while for the chips to drip before sprinkling with salt, tossing with the metal strainer, and then moving the chips to a new bowl. I wanted to know approximate nutritional value and guessed that kale/collard chips compare (oil-wise) to potato chips. One ounce of potato chips has 9.8 grams of fat, and since potatoes by themselves have no fat, I think it’s safe to guess that the fat is all from the frying. 9.8 grams of fat equates to 0.7 tablespoon of oil per ounce of potato chips. Going by the potassium and carb levels, one ounce of potato chips equates to approximately 0.6 cup of raw potatoes. So when I was adding the collard chips into my SparkPeople nutrition diary, I added 0.6 cup collards plus 0.7 tablespoon oil for every ounce of collard chips I ate, and I think it’s close enough. Two ounces of collard chips ended up being approximately 190 calories, 3 grams of carbohydrates, 20 grams of fat, and 1 gram of protein. Here is a collander of fried collard chips. I removed the stems and ribs of the collard greens by folding them in half and then whacking the ribs off. Here's my set up: Fry Daddy with the splatter screen over it, and next to it a metal colander seated in a metal bowl so the chips could drain. I also have a metal deep frying strainer in the colander for adding and removing the collards from the oil. A close up of the draining collard chips. 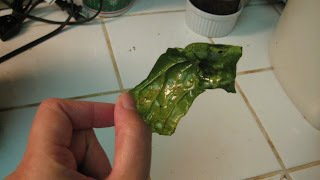 A collard chip. It's very crispy. And of course, Snickers was waiting with bated breath for droppage to occur. Wow. I'm a southern girl who's eaten every thing from deer to chitlins. But you've got one up on me Camy. I love sweet potato chips and fries, so I might have to give these a try. Your creativity extends beyond your books and into the kitchen!